The craftsmen at Humidores Habana turn wood into some of Cuba's most elaborate humidors, some of them capable of holding hundreds of cigars. See a photo gallery of Aguilera's factory and work. They stand as sentinels, half a dozen or so lined up in front of the stage at the annual Festival del Habano gala dinners, massive wooden paeans to Cuba's most famous cigar brands and the factories where they are made. Each waits to be auctioned off for hundreds of thousands of dollars. Each is also the work of master craftsmen, toiling away in neighborhoods around Havana and other Cuban cities, competing for the honor to build these carved masterpieces. One of the best known is Humidores Habana. Tucked away on a street in Cuba's capital far from the fancy tourist hotels of the Malecón, any outsider hoping to find it must stop three or four times and ask for directions. José Ernesto Aguilera started the operation in 1994, and oversees the factory. He is a simple, proud woodworker eager to show off his wares. To describe the main factory and warehouse as decrepit would be an understatement, but even that old metal-roof building is an upgrade from where he started 22 years ago, a low-ceilinged warren of tiny rooms in a basement with signs warning to duck your head. To identify his machinery would take a historian; most of the drills and lathes, with old American trademarks like Craftsman and DeWalt, date back to prerevolutionary days. The company makes masterpieces that hold cigars, including a large Punch humidor meant to replicate a cigar press. "I am very proud," says Aguilera, an earnest, wide-eyed artisan. "These humidors are the essence of Cuba. We lack a lot of material and technical equipment, but we are very proud of what we've done." He adds that part of his pride stems from knowing his work has helped raise more than $3 million over the years for the Cuban health care system. Aguilera launched his business as a metalworking operation back in the early '90s, following his original dream to earn enough to start a jewelry factory. But in early 1998, he discovered the need for humidors, and began working with wood. He was asked by Habanos S.A., the Cuban cigar monopoly, to build humidors for the Festival del Habano in 2005, one for the brand of Alejandro Robaina and one for Punch. These, like all the humidors auctioned at the Habanos Festival, are not desktop models. Each stands several feet tall and several feet wide, and can hold hundreds of cigars. The Punch humidor was given the nod as the best humidor of that year's festival, according to Aguilera. 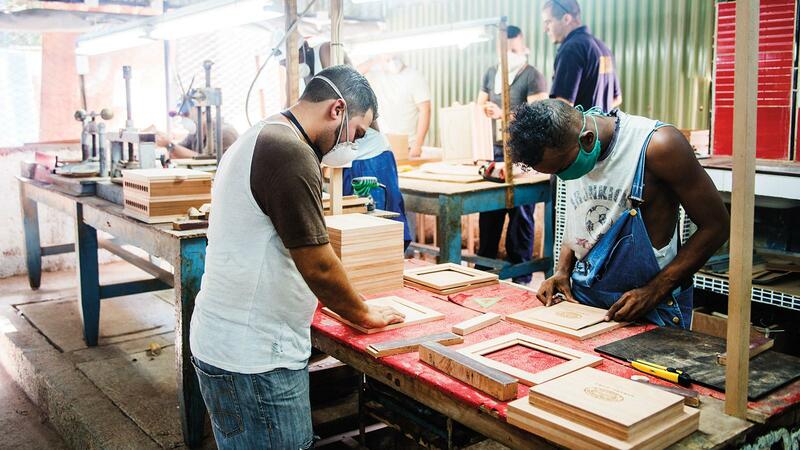 Aguilera surrounded by the Humidores Habana factory craftsmen. "From one day to the next, our life changed," Aguilera says. Today, he has 30 employees crowded into the old basement and the newer warehouse, working on five contracts simultaneously for clients in Europe. He has crafted humidors for the 135th celebration of J.J. Fox in Dublin, for the 50th anniversary of Intertabak in Europe and another humidor for the distributor of Cuban cigars in Belgium, Luxembourg and the Netherlands. "For the last three years, we have been the largest exporter of Cuba artisan works," Aguilera says. Humidores Habana crafts cylinder humidors as well. He also works regularly with Habanos S.A. making humidors for the festival, and has earned the privilege of making Cohiba humidors (which almost always receive the highest bids at the event) at least three times. He says the process begins with a design concept, which is sent to a cultural association, which then presents the designs to Habanos. At a convocation of all the humidor companies, Habanos chooses the designs it wants. "We have a designer, Carilyn de la Vega, at the National Design School, who is doing our designs now," says Aguilera. He says she executes the drawings of concepts from the factory's team, which includes him. Walking around the factory, there are signs of the many projects in process. Wood pieces are being fashioned on saws and lathes, and in one area, workers are making the marquetry, the multiple layers of wood that are cut to create intricate designs, with different colors of wood in thin strips. In one room, the harsh odors of varnish drift into the driveway. Each of the humidor's drawers are tested with weights to imitate cigars, to ensure they work properly. In another room, stacks of recovered wood beams and planks of wood cut from old furniture and other recovered items of aged cedar and caoba, are stored for use in future projects. Aguilera's goal of being a jeweler is long in the past, and he has a new one in mind. "We want to make the best humidors in the world," he says. Five small farms in Western Cuba grow some of the finest cigar tobacco leaves in the entire world. Cigar lovers from all over the world gathered in Havana to celebrate 20 years of great smokes. Joining Cuba’s cigar experts to evaluate blends for Havana’s future cigars.